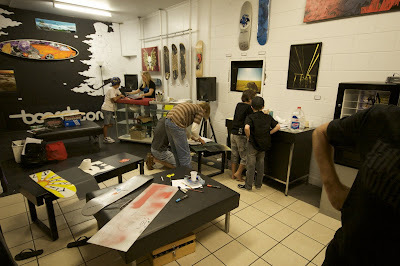 The last Create2Skate session last night went so well. The kids were all stoked to take away their boards and those who wanted to ride them added grip tape and transferred their hardware over. Their parents came to pick them up and I took a minute to tell the kids that Boardstore is run and staffed by people who loves Jesus and that God loves them and gave them the option of taking away a free Skaters Bible. They were all excited to take one and alot of them exchanged email addresses and phone numbers with each other. I loved that they had made friends and that the workshops had been a chance to build more relationships. We also invited them to Skate Church in Coolum this Saturday so hopefully some will make it. I'm so stoked on how these workshops have gone and it's made me really excited about doing it again. Matt's fully stencilled board - he came up with it all himself! Sick! The finished products! L-R Josh, Matt, Jye, Harrison, Jesse, Liam, Marshall and Jesse. Awesome ay. All the glory goes to God for giving me the idea and making it a success.